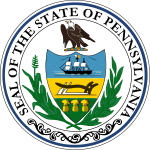 The 1797 United States Senate election in Pennsylvania was held on February 16, 1797. Incumbent James Ross was re-elected by the Pennsylvania General Assembly to the United States Senate. After Sen. Albert Gallatin was removed from office after his eligibility was successfully challenged, James Ross was elected by the General Assembly, consisting of the Pennsylvania House of Representatives and Pennsylvania State Senate, in 1794 to fill the remainder of the unexpired term, which was to expire on March 4, 1797. ^ a b "U.S. Senate Election - 16 February 1797" (PDF). Wilkes University. Retrieved 21 December 2012. ^ "U.S. Senate Election - 31 March 1794" (PDF). Wilkes University. Retrieved 21 December 2012. ^ "PA US Senate - 1797". OurCampaigns. Retrieved 21 December 2012.